Sharjah Biennial 13 School is open to participants of all ages and abilities. Launched on October 15, 2016, the SB13 School is the first part of SB13’s curatorial concept by Christine Tohme. Working with local artists, practitioners, institutions and companies, SB13 School will focus on the following elements: Water, Earth, Crops and the Culinary. The SB13 School programme will run from October 22, 2016 until October 15, 2017. This project aims to support local infrastructures in the middle, central and eastern regions of the Emirate of Sharjah and empower their various communities. The SB13 School will take place across four venues, Al Madam Art Centre, Al Hamriyah Art Centre, Kalba Art Centre and in Sharjah’s Arts Area. The courses will be aimed at various age groups and people of all abilities. Workshops at Al Madam Art Centre will focus on farming the land to create an infrastructure that will lead to self-sufficiency. The programme will also explore the existing historical remains, and archaeological findings in the region. Courses will include pottery and other local crafts to create crockery inspired by the archaeological findings. A series of culinary workshops will focus on using local produce to create dishes inspired by local and regional cuisines and their histories. Participants will be introduced to Emirati cuisine and its influences from the culinary traditions of India, Persia, Afghanistan, Zanzibar and the Arab world. The programme will also include courses on how to make local dairy products and learning about herbs and spices. Al Hamriyah Art Centre will offer courses that explore the element of water, including traditional fishing-related workshops. The programme will also focus on desalination, preparation of land for gardening, culinary and environmental awareness. Moreover, courses will include working with recycled material, composting and gardening. Kalba Art Centre will host workshops and courses on fishing and the environmental protected areas. The programme is designed to work with earth and minerals such as stone, clay and copper. Courses will include craftwork, pottery and working with metal to create crockery and utensils. Culinary workshops will also take place at Fen Restaurant in Kalba and will focus on sourcing organic fresh seafood and working with local fishermen. 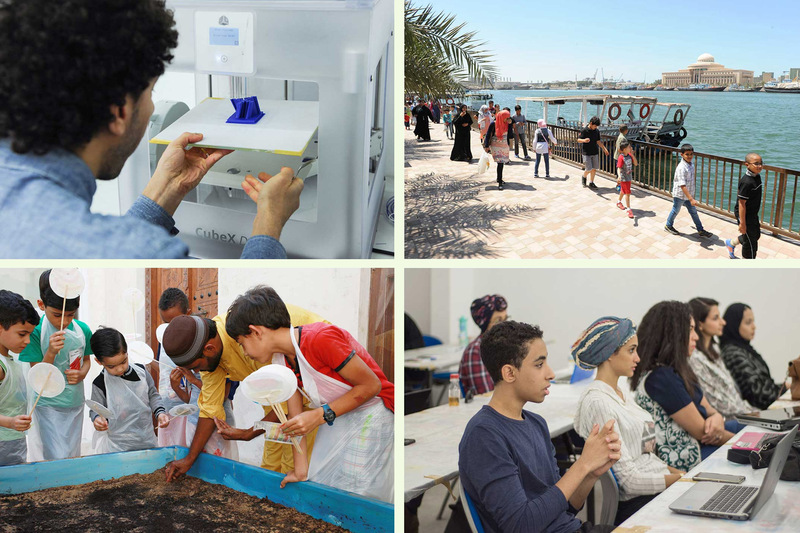 Elements of various workshops and courses will also take place in Sharjah Arts Area. The programme will also include performance, music, animation (high definition and moving image) and virtual reality workshops. Transportation is available from Sharjah Art Museum. For the full programme please click here.